Turn yourself into a upper class historical woman in this Victorian Lady Costume. Ideal Mary Poppins costume. Mix with other ladies and gentlemen of your social class at any historical and victorian themed dress up party. 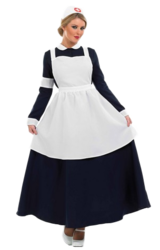 Our Victorian fancy dress for women includes a black hat, jacket, long skirt and shirt insert.